Southern Vancouver Island had vast stands of massive trees, perfect for shipbuilding. It had plenty of coal, just the right thing for powering steam-powered vessels. And it had several protected harbours, offering ideal locations for a naval station. British warships were active in the North Pacific for two decades, however, before someone connected the dots and decided that Esquimalt, British Columbia, made sense as the British navy’s base on the west coast of North America. It took events elsewhere, primarily the Oregon crisis in the 1840s and the Crimean War in the 1850s, to motivate serious action in Esquimalt Harbour. A base on Vancouver Island would discourage the Americans from continuing to push their land claims farther and farther north. It would also provide vital access to the entire North Pacific. The Esquimalt base was key to the history of the British navy in the Pacific, and it is also key to Britannia’s Navy on the West Coast of North America 1812–1914, by Victoria historian Barry Gough. This book is an expanded, updated, and much-improved version of a book Gough wrote in 1971. That one, The Royal Navy and the Northwest Coast of North America, 1810–1914: A Study of British Maritime Ascendancy, was based on Gough’s Ph.D. thesis and had the distinction of being the first book published by UBC Press. Many historians would love to have the chance to redo their most important works. New sources, new research methods, works by others, and even changes in the way we think can all make the original work less valuable with the passage of time. Gough’s work on the history of the British navy in the Pacific started long before his first book was published. In the 1960s he did research in Britain’s The National Archives, the United Kingdom Hydrographic Office, The British Library, the Royal Geographical Society, and the National Maritime Museum in London. 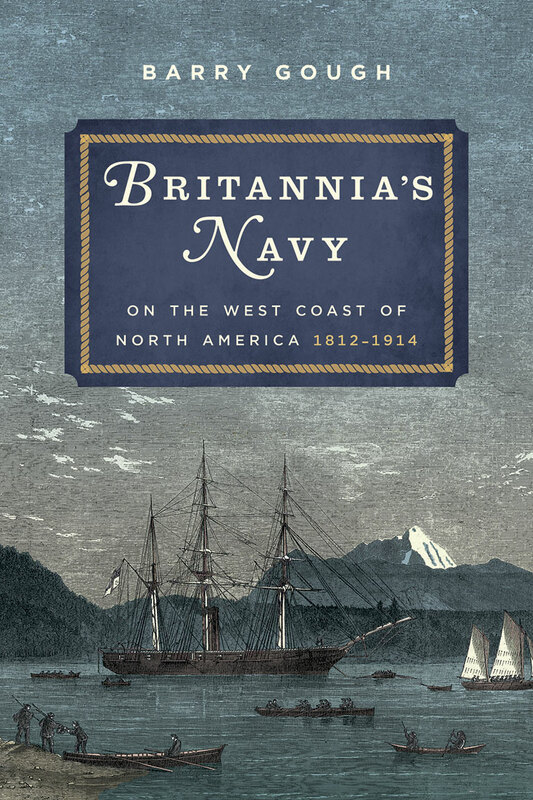 Britannia’s Navy is an important book that touches on the history of the navy, the base at Esquimalt, the development of British Columbia, the struggle for control of the Pacific Northwest, and more. The book deals with several major events in naval history, including the War of 1812, the cries of “Fifty-four forty or fight,” as well as the Pig War — the dispute over the San Juan Islands that was settled by the German kaiser. For the century leading up to the First World War — the time period covered in this book — Britannia really did rule the waves, especially the Pacific waves. And its strong presence was based in large part on the naval station at Esquimalt. After the British left Esquimalt in 1905, believing that higher priorities were closer to home, there was a sense in British Columbia that our defences had been abandoned. In reality, the Esquimalt base would not have been able to withstand an attack by the Americans, whether troops were based in Esquimalt or twenty days away in Hong Kong. A few years later, Esquimalt became the base for the new Canadian navy. It continues to have strategic importance to Canada and for the entire Pacific Rim. Gough has produced a readable, meticulously researched, and highly detailed book that includes a series of appendices listing the commanders and ships in service in these waters. More importantly, he has given us a sense of the people who made the decisions that shaped our history. That enables us to gain a better understanding of why they did what they did. Britannia’s Navy will help to inform researchers and scholars for decades to come. As well it should — after all, it is the product of a lifelong labour of love. Dave Obee is a member of the board of Canada’s History Society, the author of several books on history and genealogy, and the editor-in-chief of the Times Colonist in Victoria. Book Review: No stranger to controversy, political writer Yves Engler would strike Pearson off CBC's list of Greatest Canadians — and in Lester Pearson’s Peacekeeping he goes so far as to suggest that Pearson was fit to be tried for abetting war crimes. Book Review: Wright’s argument is that Trudeau’s triumphs had nothing to do with charisma, or television, or the new nationalism of the sixties, but everything to do with Trudeau’s ideas. In Wright’s view, Trudeau was not a man of the future but a man of the past who had been honing his intellectual position since 1955 or thereabouts. Book Review: If anyone can take the topic of colonial settlement on the prairies and make it sing, it’s Carter. A historian in the Faculty of Native Studies at the University of Alberta, her focus is the intersection of gendered colonial-Indigenous relations on the prairies. With Imperial Plots, Carter has again proven her talents.